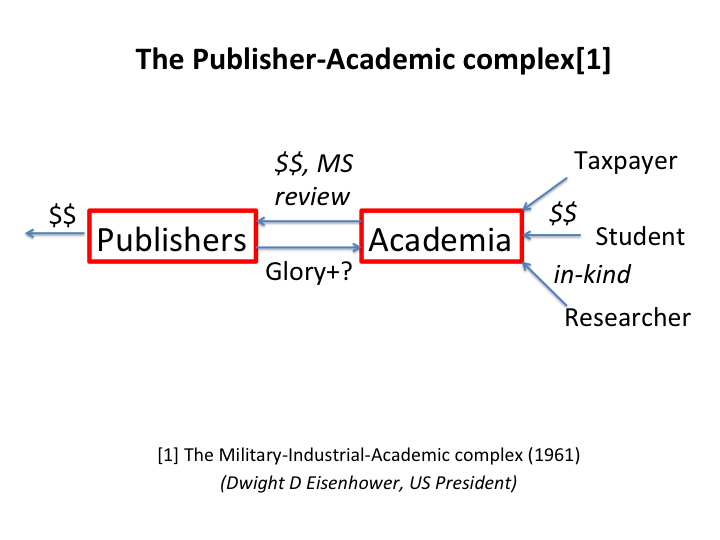 The Publisher-Academic Complex; "put your bodies upon the gears"
we must guard against the acquisition of unwarranted influence, whether sought or unsought, by the military–industrial complex. The potential for the disastrous rise of misplaced power exists, and will persist.We must never let the weight of this combination endanger our liberties or democratic processes. See Wikipedia The phrase may also have originated as “military–industrial–scientific complex” or , even more relevantly “military–industrial–academic complex”. There are variants of the A-B (-C) complexes and they are characterised by uncontrolled and of secret feedback loops. Academia feeds the military / industry with intellectual manpower and exclusive discoveries and they in return provide funding. 10 years ago MIT got 700 M USD– although it’s out of scope here. The feedback loops are self-sustaining. There is an element of positive feedback in that each component is fed from and feeds back in increasing amount. It’s noteworthy that although taxpayer money fuels this there is no direct control due to the secrecy. I believe we have a similar, and pernicious, cycle in the close, uncontrolled ties between academia and tcPublishers. The same secrecy exists – fees and income are often governed by secrecy clauses and comparison of costs and prices is largely impossible. The tcPublishers are accountable only to their shareholders. Here’s my analysis. The taxpayer and student (yes students pay large fees) fuel academia who give raw material, reviews and money to the tcPublishers who in return provide academia with typeset versions of the supplied material, sometimes with additions from the academic reviewers. But the main modern return is now glory – branding and standing in the community. The standing is determined by arcane procedures such as impact factors which are secret and inaccurate and largely discredited. However this glory feeds the ability of the universities to recruit money and standing in another feedback cycle. This cycle is completely uncontrolled. Almost all major industries are controlled. Banks, energy companies, transport, medicine. The scholarly publishing business now approaches 20 Billion USD, and I cannot easily think of other infrastructural industries which are completely unregulated. I compare this to luxury consumer goods where the price is arbitrary – fashion, mineral water, cosmetics. Yet, as I argue, this cycle exerts a pernicious stranglehold on the much larger flow of scientific knowledge. Much re-use is stifled, both by inertia and actual legal controls and the loss can be measured in hundreds of billions. (Oh yes ; i assert that “Closed access means people die” but I’m accused of being emotive. I was even told that it’s irresponsible without a double-blind trial (true)). Among the problems of uncontrolled feedback loops is that they are uncontrolled. Humans have controlled machines for centuries and they have also controlled their societal creations. But publishers have no restraints. There costs are low, because the manufacturing cost of glory is very low. True they have costs in lawyers, marketeers, lobbyists, but they can charge universities more each year (we keep getting told of shrinking budgets, but it’s not the universities’ money – it’s ours). And now the system has become established and tcPublishers are driving the universities. This greed results in waste and injustice. The biggest waste is young people, many of whom are broken in the lottery of the glory chase. But there is an increasing amount of duplication, retraction, and metric-chasing-driven “research”. We were told the following: If President Kerr actually tried to get something more liberal out of the regents in his telephone conversation, why didn’t he make some public statement to that effect? And the answer we received, from a well-meaning liberal, was the following: He said, ‘Would you ever imagine the manager of a firm making a statement publicly in opposition to his board of directors?’ That’s the answer! Well, I ask you to consider: If this is a firm, and if the board of regents are the board of directors; and if President Kerr in fact is the manager; then I’ll tell you something. The faculty are a bunch of employees, and we’re the raw material! But we’re a bunch of raw materials that don’t mean to be—have any process upon us. Don’t mean to be made into any product. Don’t mean… Don’t mean to end up being bought by some clients of the University, be they the government, be they industry, be they organized labor, be they anyone! We’re human beings! I think we’ve come full cycle and that the Publisher-Academic Complex is becoming so odious, so sick at heart that we can’t take part. It’s not a question of cosmetic changes (like the irrelevant gesture from NPG in giving us back a tiny part of the commons under absurd rules . It’s about the injustice, the unanswerability of unrestricted quasi-monopolistic neo-capital. That’s the theory. In the neo-liberal politics of UK they seem intent on removing the controls, which will, of course destroy significant parts of the society we have built up. The whole NPG #scishare project is flawed, overexaggerated by the Nature publicity machine and I shall deconstruct it in the next blog post. 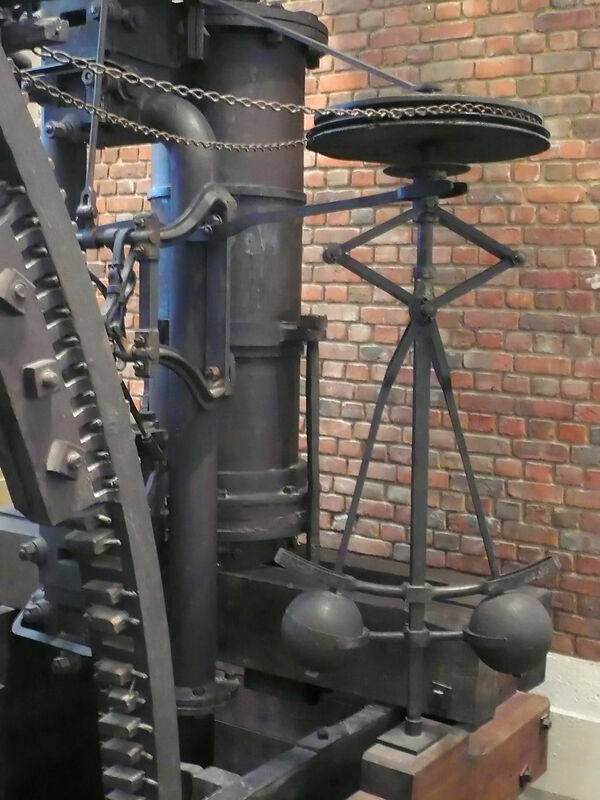 4 Responses to The Publisher-Academic Complex; "put your bodies upon the gears"
I of course agree with you, though not on your analysis of academic publishing as an unregulated business. I’d say it’s the total opposite. -Copyright is a regulation – a form of monopoly granted by the state. The very existence of copyright allows tcPublishers to exist. -There is no competition in tcPublishing: major publishers form a cartel, fixing prices. They should be tried for antitrust. So of course the publisher-academic-complex is f*cked up. But the solution, in my opinion, isn’t more regulations, but actually less. >>I of course agree with you, though not on your analysis of academic publishing as an unregulated business. I’d say it’s the total opposite. The *publishers* are unregulated. Or rather all the regulations are in their favour. >>-Copyright is a regulation – a form of monopoly granted by the state. The very existence of copyright allows tcPublishers to exist. >>-There is no competition in tcPublishing: major publishers form a cartel, fixing prices. They should be tried for antitrust. I completely agree. Substitute “antitrust” for regulation and we are using the same language. I cannot discount this hypothesis. I have no personal knowledge of corruption but equally I have no evidence it does not exist. On my suspicious days I believe you.